Account Based Marketing, while no longer a subject for the niche marketer, still has its challenges to create and engage the right people. It’s one thing to decide you can use ABM practices and tools to sell and service your account base, it’s another thing to actually create the account list. Some marketing people say they can do it in a week or so and six months later they are still struggling to define exactly who is on the account list. In this program, Lena Shaw, Director of Marketing for LeadGenius describes how to solve the biggest hurdle in setting up an Account Based Marketing program: the list. The host this week is Susan Finch. 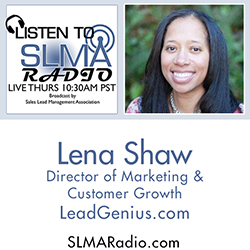 Lena Shaw is the Director of Marketing and Growth at LeadGenius, a lead generation and account-based marketing (ABM) solutions company that has helped scale more than 120 growing B2B companies. Prior to LeadGenius, Lena managed social media and digital marketing efforts at Teach for America and The University of San Francisco. Connect with Lena on LinkedIn or follow her on Twitter.